Let's start with the exciting stuff, shall we? I have two autographed books by Elsa Watson to give away! Wee-haw! Dog Days goes to Steven J. Wangsness! Maid Marian goes to Barb Davis-Pyles! Congrats to the lucky winners! Steven and Barb, please e-mail me with your mailing addresses! Thank you to everyone who entered! You people are fun! I'm going to take a blog break until September. My family and I are even busier than usual this summer, and I want to spend all of my writing time focusing on my manuscript. I'll be eager to hear everyone's news when I return! 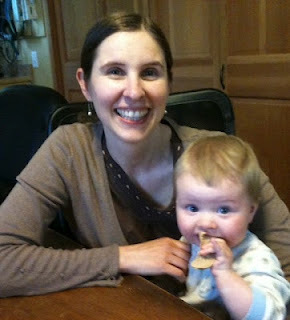 Happy writing and illustrating, bloggy friends! See you in September! Hee! Author Elsa Watson is a good friend who is an absolute sweetheart and a super talented writer. I'd already interviewed her for our library's newsletter (the article will be out soon, local peeps! ), but I thought it would be fun to also do a blog post featuring Elsa. Lucky for us, she agreed! We got together at her work, the West Sound Wildlife Shelter, and we chatted about kids, writing, and dogs--our usual topics. Elsa is incredibly kind and open, and the minutes fly by whenever I get to hang out with her. While the initial plan was to do another interview, it felt more natural to have a casual conversation about writing and share the highlights. Let me start by telling you a bit about Elsa. 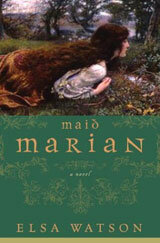 Elsa's first novel, Maid Marian, is a wonderful re-telling of the Robin Hood legend. She currently writes contemporary women's fiction. 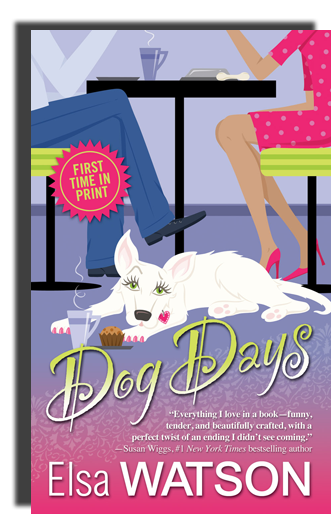 Her latest book, Dog Days, is a hilarious story where a woman and a dog switch bodies--like in Freaky Friday, but with a canine twist. In addition to being funny, it's poignant and well-plotted. I love it! What may impress you more, though, is the opinion of the Publishers Weekly folk. They gave it a starred review. 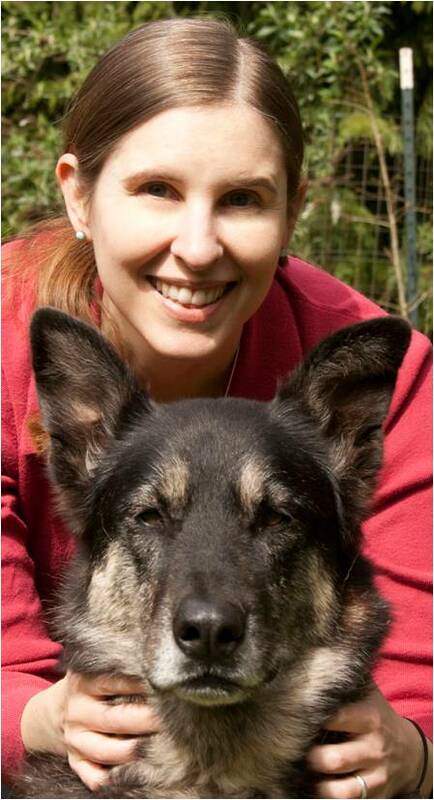 Jessica Sheldon knows that Woofinstock, Madrona's annual canine festival, is make-or-break time for her beloved café. Since the "incident" that falsely branded Jessica as her dog-crazy town's resident dog hater, Glimmerglass has been deserted. Determined to prove her canine credentials, Jessica rescues Zoë, a stray white German shepherd, during a storm. When the two are struck by lightning, the unbelievable happens--Zoë and Jessica switch bodies. Learning to live as a dog is difficult enough, but Jessica is desperate to save the Glimmerglass from bankruptcy. To complicate matters, she's falling hard for Max, the town's hot veterinarian. Zoë, on the other hand, is thrilled to be human, relishing all of Woofinstock's fun and food, and Jessica is certain she'll be labeled a crazy dog hater--if she ever gets back in her own body. But Zoë is anxious to use her new human skills to find her missing family--who may not want her back. Jessica and Zoë will need to work together to set things right, and possibly find acceptance and love in the bargain. As we sipped our lattes, I asked Elsa when she first identified herself as a writer. She said, "I think it's hard for every writer to really believe that they are a 'writer.' We're all plagued with doubts and fears that we aren't good enough even though, at the end of the day, a writer is someone who writes. Whether you're working on your first book or your twelfth, if you're writing you're a writer. Now having said that, there were times even after Maid Marian was published when my husband had to give me a little poke and say, 'Hey, you're a real writer. Don't forget it.'" I asked her about her writing journey. "I think I held onto historical fiction in a stubborn way. After Maid Marian came out, I wrote five historical fiction books that no one wanted to buy. Looking back, if I had been a little smarter, I think I might have stopped at the second or third book and started something new." She laughed. "But the hard truth is I probably had to write those books to say good-bye to historicals. "It's scary to try something new. And writing a new kind of book wasn't completely smooth and easy. I had a lot of false starts. I spent a whole summer writing and rewriting the first chapter. It took me a long time to figure out how to plan and structure a contemporary story. I realized, during this process, that I needed to spend more time planning up front and not just jump into the writing. That was a hard lesson to learn." I said, "It sounds like something that helped you get to the next level." She told me it was. "This was a key moment for me. I was at a Field's End writers' conference, listening to a breakout session by Royce Buckingham. He asked the group how many people had had stories rejected by agents because the agent just didn't fall in love with it. Lots of people raised their hands, me included. Then he asked how many people had ever had a story rejected because the writing wasn't good enough. No one raised their hands. His point was that we spend ninety percent of our time writing the book and ten percent planning the book when what we need to do is spend fifty percent on each." I asked Elsa if she had any other advice for writers. "I would suggest the book Save the Cat by Blake Snyder. Especially for anyone who feels they need help planning and plotting--like I do." Here's Elsa with her cutie-pie baby boy. Not even a year old, he's already managed to steal oodles of hearts. He let me hold him and get my baby fix before he munched on a bagel in his mom's lap. Now for the giveaway! You have two chances to win because we're giving away one autographed copy of Dog Days and one autographed copy of Maid Marian! Any follower with a mailing address in the U.S. or Canada can enter. Just leave a comment before 11:59 p.m. on Sunday, June 10, 2012, and you'll be entered in both drawings. I apologize to my international bloggy friends for having to set limits; I wish I could include everyone. Thank you, Elsa, for being a guest at my blog and for donating a book to the giveaway! I'm betting you'll inspire others the way you inspire me!